Wombourne station opened in 1925 under the GWR on what is commonly termed 'the Wombourne Branch' which ran from the old OWWR line from Stourbridge to Dudley and joined the old GWR main line north of Dunstall Park. 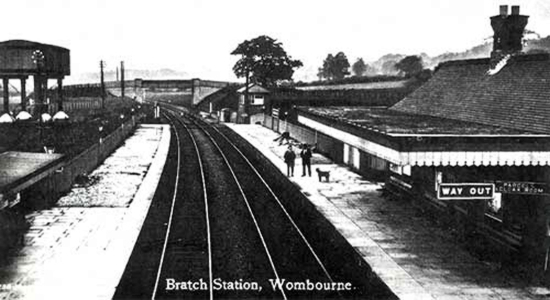 The photograph above looking down from the footbridge, taken from a postcard issued around the time of its opening, shows us that the station was originally known as 'The Bratch station', 'the Bratch' being a water course running near the site: this was quickly dropped in favour of a more geographical naming scheme. 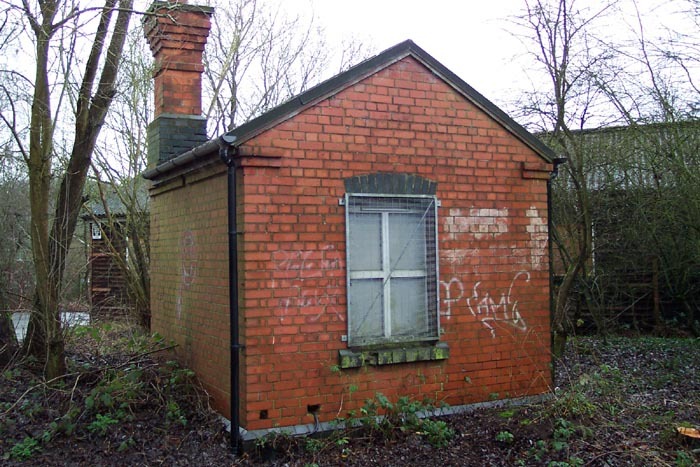 We can also see that, when compared with the other stops on the line, Wombourne was a station of some size (unlike the many halts on the route) with a water tower on the northbound platform and a signal box. However, the relative grandeur of the station did nothing to stimulate passenger growth and the station, as with the rest of the stops on the line, closed to passengers in 1932; a mere 7 years after opening. The line itself fared considerably better than the passenger services, however, and continued for goods traffic and as an avoidance line for Wolverhampton and finally closed in 1965. 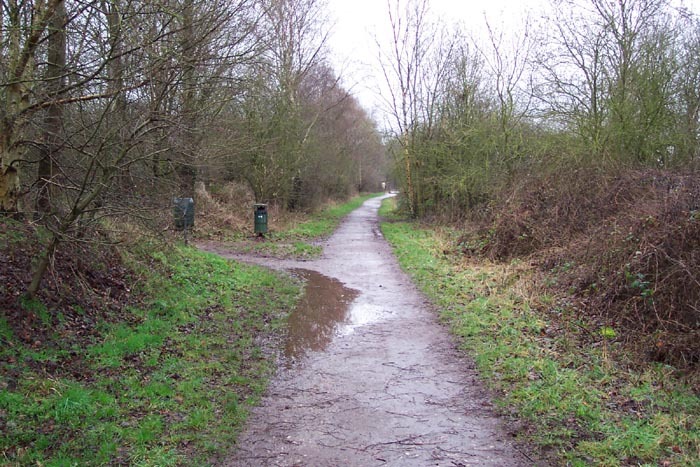 The trackbed is now utilised for the South Staffordshire Railway Walk. 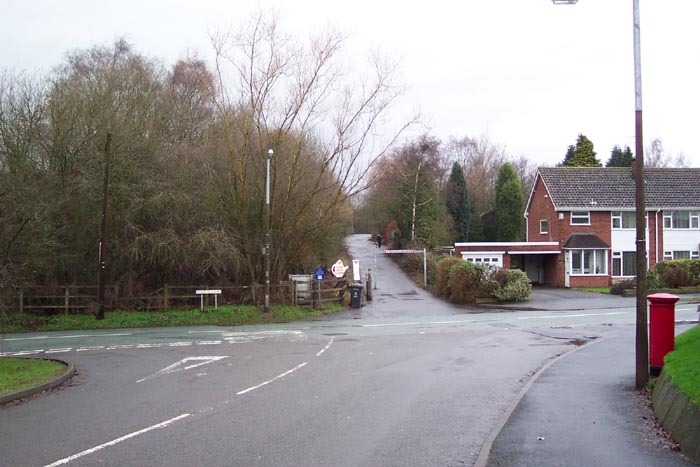 Above-left we see the entrance to the station driveway from Bratch Lane - to the left of this entrance, but out of shot, is a bridge carrying the railway over the road. Above-right we have just begun to walk up the entrance driveway to the station. 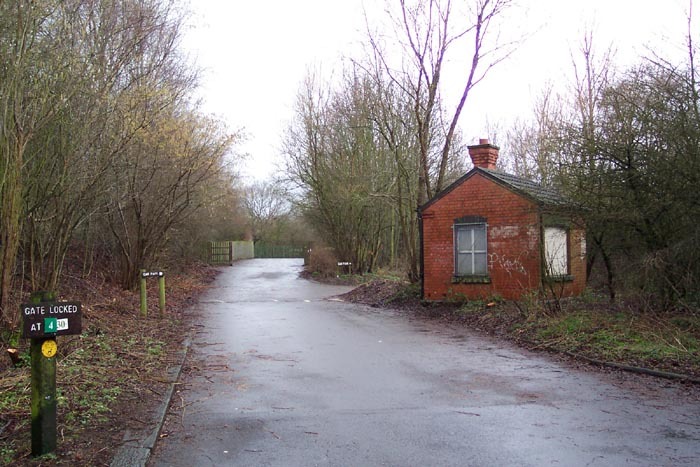 The building on the right in fact the weigh bridge office, as Wombourne had a goods yard and several sidings, and is in perfect, if unused, condition. The track lies to the left at a raised level and the station proper is dead ahead beyond the picket fencing with the yard and goods sidings ahead-right. Above-left and right are two more shots of the weigh bridge office near the entrance to the station approach driveway: we can see both the front and rear, respectively. It is a good example of its kind and it is just a shame that the weigh bridge itself, that would have been sunk into the driveway next to the office, has long-since been removed. 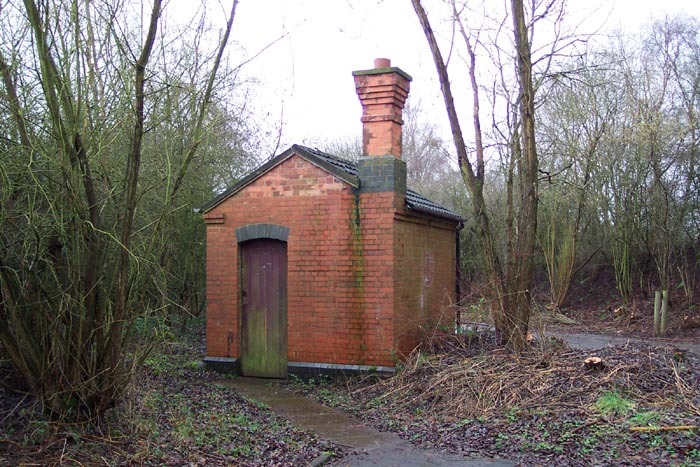 Another good example of such a structure can be seen on the Tettenhall pages. 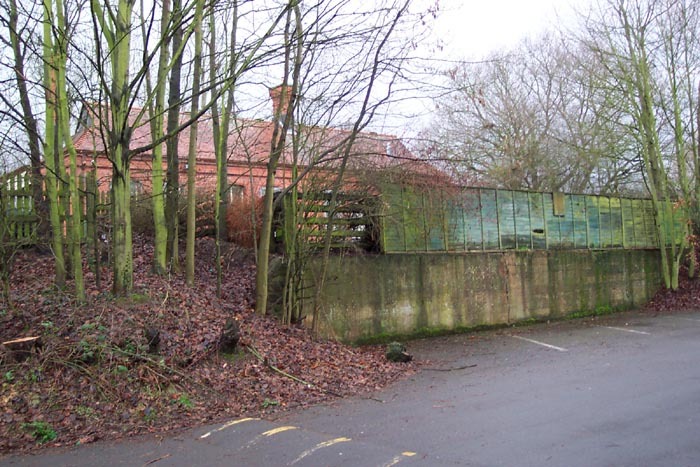 Above-left we get a tempting glimpse of what remains at the site as we arrive at the top of the approach road seen on the previous page and move around into the present-day car park (which now also houses Wombourne Dog Training Centre!) that used to house the goods sidings and yard. 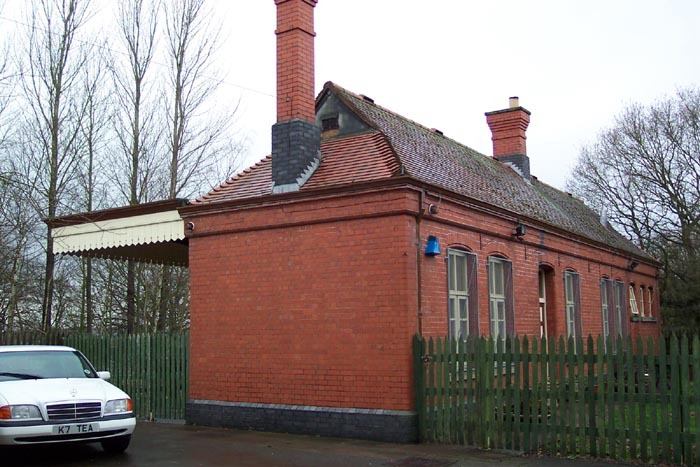 The Stourbridge platform building, the main station building and booking office, is still in situ and is now used as a tea room for ramblers on the South Staffordshire Railway Walk. The concrete wall in the foreground is not, as you will have guessed, an originally feature but one added to permit the ground behind it to be built up to platform level to form a garden for the tea room: originally this would have been the steps up to the booking hall. Above-right we have moved back to the top of the approach road and can see that the building is in good repair and its canopy in tact with familiar GWR-style 'darting' around its edge. 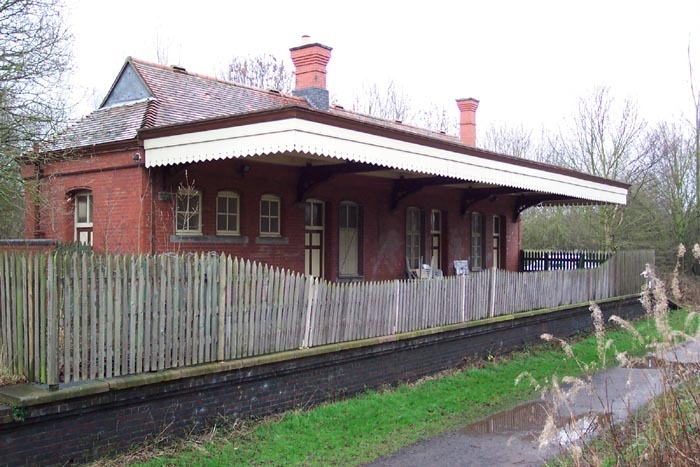 I have to admit to being quite excited at finding the booking hall/station building still on site and in good repair. 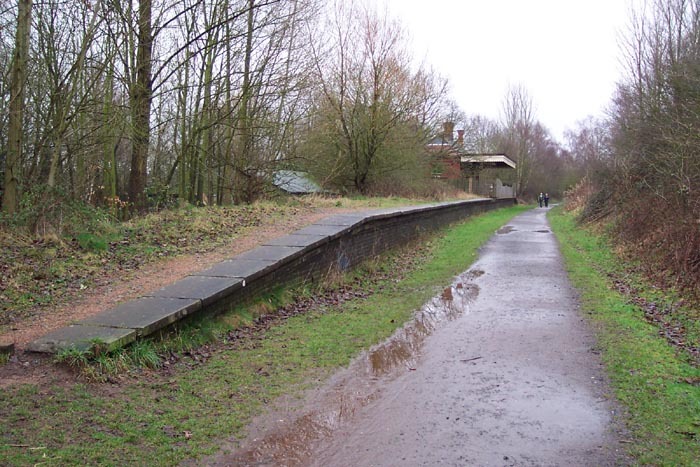 The above-left photograph is looking at the track-side of the building on the Stourbridge platform: the photographer is standing on the heavily overgrown northbound platform. Above-right we are at the Stourbridge end of the Stourbridge platform looking north: the footbridge from which the old photograph at the top of the previous page was taken would have been just in front of where the photographer is standing. 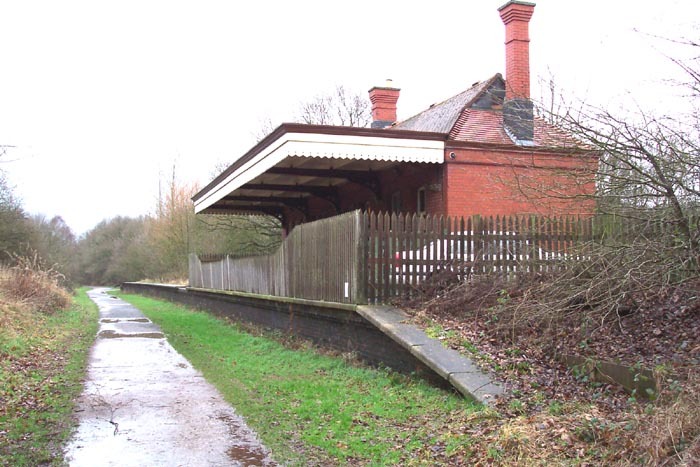 Above-left we are at the northern end of the Stourbridge platform looking south: the signal box seen in the old photograph would have been immediately to our left here but no trace remains today. Above-right we have the station to our rear and are watching the trackbed head off towards Himley and on to Stourbridge Junction. This site is well-worth a visit (preferably on a drier day than the one on which I visited as I was sliding all over the place to take the pics) and it is great to see such a station mostly preserved.